Popular Technology.net: Rebuttal to "Crock of the Week - 32000 Scientists"
Peter Sinclair AKA "Greenman" a cartoonist and Al Gore disciple has been hard at work creating YouTube videos that smear skeptics and their arguments. The following is a complete rebuttal to his "Crock of the Week - 32000 Scientists" video challenging the petition of 31,486 scientists who reject global warming alarm. His obvious credibility is likely why alarmists feel the need to desperately try and smear him. It is clear they cannot have someone with Dr. Seitz's impeccable credentials doubting their call for global warming alarm. "To find out if the startling claim was true -- that Seitz "directed a 45M tobacco industry effort to hide health impacts of smoking" -- I called him at his apartment in Manhattan. Unless there is more to the story, the accusation appears to be a willful distortion, if not an outright lie. "That's ridiculous, completely wrong," Seitz told me. "The money was all spent on basic science, medical science," he said. According to Seitz, the CEO of RJ Reynolds -- the tobacco company -- was on the board of Rockefeller University while Seitz was a full-time employee there. "He was not a scientist," Seitz said of the executive, but he believed in supporting the University's dedication to basic research -- in a little over a century, Rockefeller University has had 23 Nobel Prize winners affiliated with it, in fields of medicine and chemistry. RJ Reynolds allocated $5 million a year to Seitz to direct basic research. To figure out how to distribute the money, Seitz says he assembled some top folks in different fields of scientific research -- such as James Shannon, the director of the National Institutes of Health for 13 years, and Maclyn McCarty, the legendary geneticist -- to help direct the funds. When I asked Seitz if he ever spent money to try to debunk a link between smoking and ill-health, he said no. When I asked him if he himself had ever denied a link between smoking and cancer, Seitz (who, remember, is almost 100 years old) again said no and told me "my father was a 19th century man, and even he told me from when I was young that there was a connection between smoking and cancer" and that "we often talked about the hazards of smoking." In other words, Seitz was aware of the ill-effects of smoking for a very long time, and has never tried to deny that." 3. Sinclair ironically uses a memo from a tobacco industry executive to try and discredit Dr. Seitz as incompetent. Apparently what the tobacco industry says is only truthful when it attacks a scientist Sinclair disagrees with. So which is it Sinclair, are we supposed to believe the tobacco industry or not? 4. Sinclair lies that Dr. Seitz's 1996 editorial in the Wall Street Journal about the IPCC deleting key sections from the final report is not true. The fact is Ben Santer who was the IPCC lead author in question recently admitted to deleting information from the final report. "Robinson admits it is no coincidence that the article, which he designed on his computer, looks like one published by the academy. 'I used the Proceedings as a model.' he says, 'but only to put the information in a format that scientists like to read, not to fool people into thinking it is from a journal." "The Malakoff Science article also includes a picture of the first page of our 8-page article. The photo clearly shows no journal name, no submission date, no submitting scientist (required by the Proceedings), and "January 1998'' printed in a format never used by a journal. The article is also twice as long as permitted in the Proceedings (in which I have published several papers) and has other textual and format differences that I introduced to make it easier to read. It actually never occurred to me that this format complaint would be made - probably because I actually expected more." "The review article sent with the petition could not possibly have been mistaken for a PNAS reprint. I have published many research papers in PNAS. I am very familiar with reprint formats. The PNAS claim originated because Frederick Seitz - past president of the National Academy and past president of Rockefeller University signed a letter that was circulated with the petition. (Dr. Seitz, like everyone else who has actively opposed the "enviro warmers" has been smeared with many false claims.) Also, the first signers of the petition were several rather famous members of the National Academy." "Only one false name has ever appeared on the petition. It was put there by Ozone Action (now Greenpeace USA) and removed immediately thereafter. ...No one has been listed who did not actually sign - except the Ozone Action signature, which they sent with false credentials, a false address, and a false signature." "In a group of more than 30,000 people, there are many individuals with names similar or identical to other signatories, or to non-signatories – real or fictional. Opponents of the petition project sometimes use this statistical fact in efforts to discredit the project. For examples, Perry Mason and Michael Fox are scientists who have signed the petition – who happen also to have names identical to fictional or real non-scientists." 10. Sinclair attempts to imply that because the petition explicitly categorizes the qualifications of signers by their degree field this is somehow a problem. The medical science field he criticizes is clearly separate and includes 3,046 signers. After criticizing the petition for including MDs he then asks if you would ask someone with a BA degree to diagnose you for lung cancer? The petition has nothing to do with lung cancer and I believe most people would ask the MDs on the list that he ironically criticizes for their inclusion. 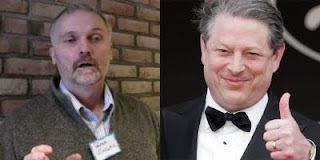 "Sinclair studied with Al Gore in dealing with the issue of global warming and is an award-winning animator, illustrator and syndicated cartoonist." 12. Sinclair finally just flat out lies and says "there are no 30,000 scientists" after failing to prove this or any of his other bogus claims. Instead he chooses to just use propaganda clips related to smoking throughout his video, which has nothing to do with global warming or the petition. Maybe Peter should stick to what he is really interested in, campaigning against smoking. It's about someone took this guy to task for his amateurish, lying viscous attack videos. Notice the little things that expose that far from being an objective defender of science, much of "Greenman" is motivated by hard-core ideology. For instance, using that fact that someone worked in the private sector to discredit them is not what an objective, scientific person does, it is what a socialist ideologue does. And notice the glaring simplicities in his argument. Because the CEO of R.J. Reynolds supposedly "covered up" the links between smoking and cancer (and the tobacco haters would know about covering up, they have been hiding the fact that secondhand smoke is a myth for years, and many of them rail against tobacco yet support pot smoking, and as your brilliant article about it points out, marijuana is ten times worse than tobacco in terms of cancer, other health effects and oh, it makes you intoxicated too, but I digress) than that means anyone associated with him was evil too and part of the plot. Did it ever occur to them that people do both good and bad? As your post notes, the funding money from tobacco did a lot of good and great research came from it. But left-wing socialists do not deal in nuances like that. They dig into the past, find anything that smacks of "dirt", and use that to demonize. Facts be damned. And notice how lefty websites like Little Green Footballs use Sinclairs videos to attack those question the environmental/AGW orthodoxy. It's sad that they are so lacking in the ability to argue and reason for themselves that they have to default to that little twerp. I'd love to see debunking Sinclair's videos become a regular feature. Heck, why not go back and debunk some of his earlier ones? Okay, in lieu of a regular feature, how about putting up the responses skeptics have had to Greenmans "videos" from blogs and whatnot?